With its high-quality aluminum and composite components, the 1/10, 2WD GRANITE BLX is the unbeatable combination of performance and fun! 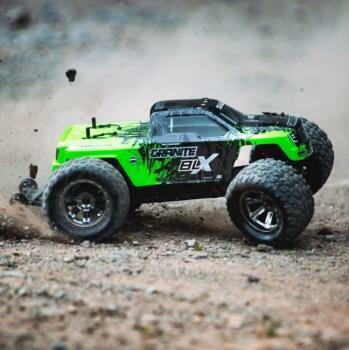 The sturdy suspension arms, all-metal diff and waterproof electronics are just some of the features that add durability â€” while the BLX brushless power system and lower center of gravity deliver speed and handling that other Ready-to-Run monster trucks just can’t match! Fully assembled and packed with features. 4-pole 3800kV BLX motor for awesome speed. Waterproof ADS-7M metal gear steering servo, radio box and BLX85 ESC. Tactic TTX300 3-channel SLT radio.